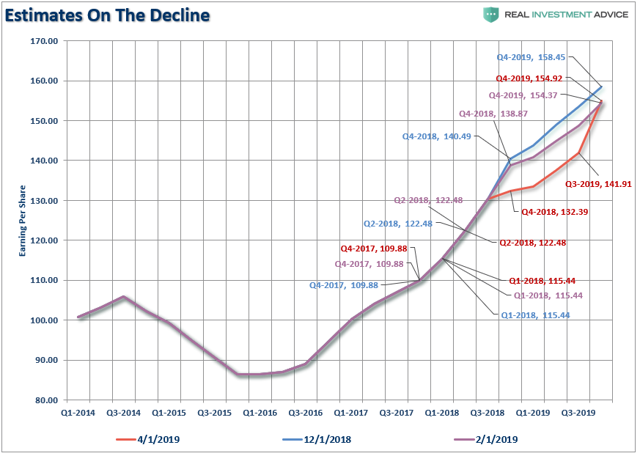 With the fourth quarter of 2018 reporting season now behind us, we can take a look at what happened with earnings to see what's real, what's not, and what it will mean for the markets going forward. During the last quarter of 2018, quarterly operating earnings declined from $41.38 to $35.03 or -15.35%. On Wall Street, earnings season has simply become "Millennial Soccer" where scores aren't kept and everyone gets a "participation trophy" just for showing up. "The benefit of a reduction in tax rates is extremely short-lived since we compare earnings and profit growth on a year-over-year basis. In the U.S., the story remains much the same as near-term economic growth has been driven by artificial stimulus, government spending, and fiscal policy which provides an illusion of prosperity. 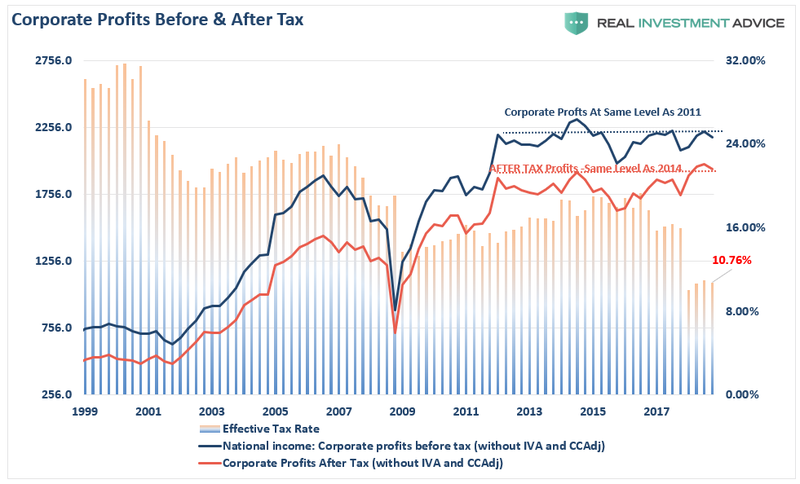 For example, the chart below shows raw corporate profits (NIPA) both before, and after, tax." "Importantly, note that corporate profits, pre-tax, are at the same level as in 2011. In other words, corporate profits have not grown over the last 7-years, yet it was the decline in the effective tax rate which pushed after-tax corporate profits to a record in the second quarter. Since consumption makes up roughly 70% of the economy, then corporate profits pre-tax profits should be growing if the economy was indeed growing substantially above 2%." Furthermore, note that since I originally penned that article, after-tax corporate profits have declined back to 2014 levels. My…how quickly the "tax cut boost" faded. With roughly all of the 4th quarter 2018 earnings now in we can look at the results. All data used is derived from Standard & Poor's. During the last quarter of 2018, quarterly operating earnings declined from $41.38 to $35.03 or -15.35%. While operating earnings are completely useless for analysis, as they exclude all the "bad stuff" and mostly fudge the rest, reported earnings declined by from $36.36 to $28.96 or -20.35%. "But if earnings declined by that much, how is that so many companies beat their estimates?" That beat rate was simply due to the consistent "lowering of the bar" so companies can get over the hurdle. On Wall Street, earnings season has simply become "Millennial Soccer" where scores aren't kept and everyone gets a "participation trophy" just for showing up. More on this in a moment. For the entire 2018 reporting year, operating earnings per share rose from $124.51 per share in Q4 of 2017 to $151.60 in Q4 of 2018 for a 21.76% annual gain. Reported earnings also rose from $109.88 to $132.39 during the same period for an annualized gain of 20.49%. Before you get all excited, that surge included the benefit of the massive corporate tax reduction. However, those gains aren't all that noteworthy when you consider that on an annualized basis 2017 operating earnings growth was 17.17% and reported earnings growth was 16.21% which was without the benefit of tax cuts. Not nearly as exciting as the media made it out to be is it? However, let's get into the analysis of what happened, and what it means for the markets going forward. "Nicolas Colas said that Wall Street analysts started the quarter with bullish earnings expectations of about 3% growth but are now looking for a 4% drop, which could cause problems for the market. 'That's the worst comp [comparable] and the first negative comp since 2Q of '16,' he said, in reference to how those results compare with prior periods. 'Even if companies beat materially though, the big issue here: Revenue growth is still supposed to be 5%. So margin pressure is going to be the story for this quarter.'" This is correct and it is also coming on the heels of a sharp slowdown in growth in the last two quarters. 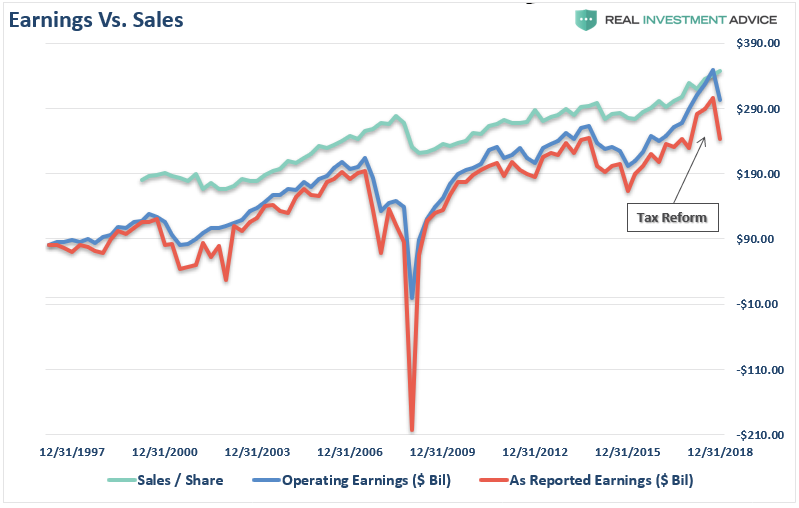 Note that while revenues have not yet turned lower, revenues tend to lag downturns in earnings. It is also worth noting that sharp downturns in earnings preceded the onset of recessions in 2001 and 2008. 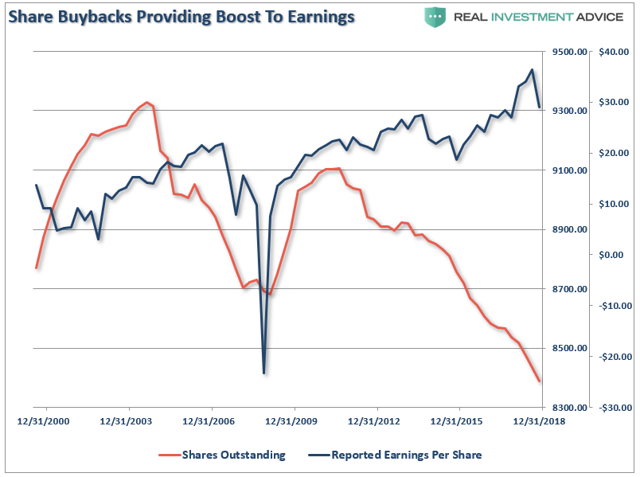 More importantly, earnings fell as share buybacks set new records in 2018. With corporations expected to set a new record in share repurchases again in 2019, the question will become how much "bang for the buck" are they getting? Of course, such should not be a surprise. The reality is that stock buybacks create an illusion of profitability. Such activities do not spur economic growth or generate real wealth for shareholders, but it does provide the basis with which to keep Wall Street satisfied and stock option-compensated executives happy. But optimism is certainly one commodity that Wall Street always has in abundance. When it comes to earnings expectations, estimates are always higher regardless of the trends of economic data. 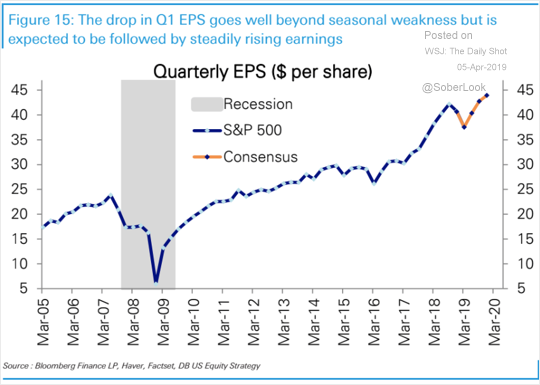 As shown, Wall Street is optimistic the current earnings decline is just a blip on the way to higher highs. Unfortunately, the difference between Wall Street's expectations and reality tends to be quite dramatic. You can see the over-optimism collide with reality in just the last two months. Since the beginning of December, forward expectations have fallen as economic realities continue to impale overly optimistic projections. Just since February, the estimates for the front half of 2019 have plummeted. The chart below shows the changes in estimates a bit more clearly. 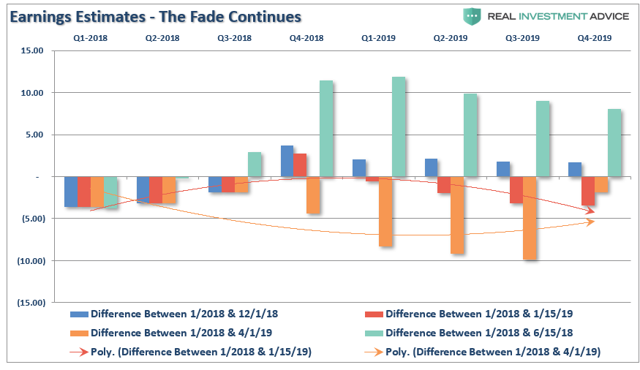 It compares where estimates were on January 1st, 2018, versus June and December of 2018 and January and April of 2019. You can see the massive downward revisions to estimates from June of last year to April of this year. As I stated above, this is why a high percentage of companies ALWAYS beat their estimates. Had analysts been required to stick with their original estimates, the beat rate would be close to zero. This is the part where I get to say "I told you so." "Wall Street is ignoring the impact of tariffs on the companies which comprise the stock market. Between May 1st and June 1st of this year, the estimated reported earnings for the S&P 500 have already started to be revised lower (so we can play the 'beat the estimate game'). For the end of 2019, forward reported estimates have declined by roughly $6.00 per share." 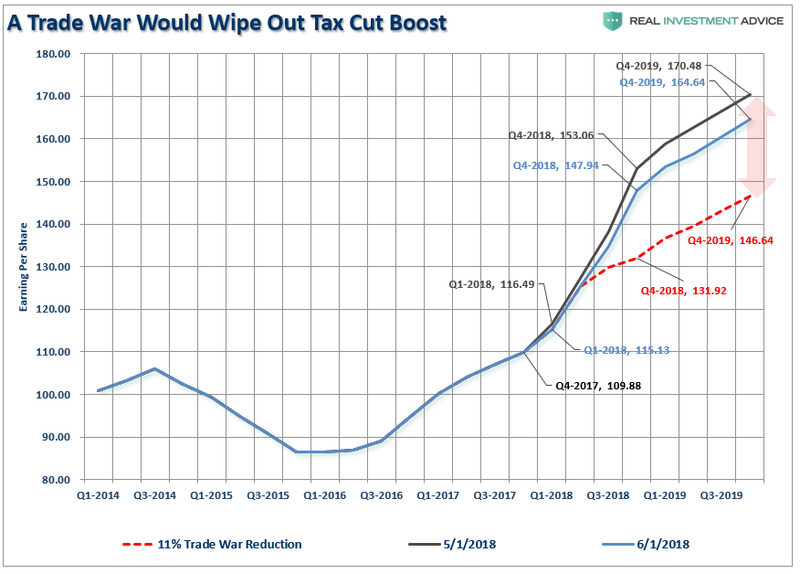 However, the red dashed line denotes an 11% reduction to those estimates due to a "trade war" where an across-the-board tariff of 10% on all US imports and exports would lower 2018 EPS for S&P 500 companies and, thus, completely offset the positive fiscal stimulus from tax reform." Surprise! As of the end of the Q4-2018 reporting period, guess where we are? Exactly 11% lower than where we started which, as stated then, has effectively wiped out all the benefit from the tax cuts. 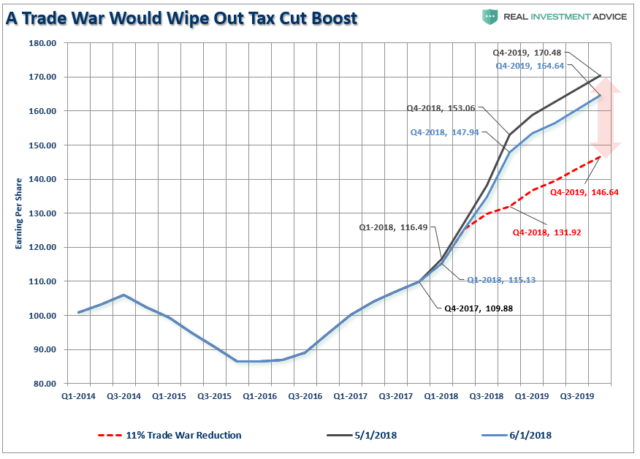 Sadly, as we noted several times in early 2018, the entire piece of legislation to cut corporate taxes was squandered with "Trump's trade war" which has yet to yield any tangible positive benefits, economically speaking. Importantly, the estimates for the end of 2019 are still too high and will need to be revised lower over the next couple of quarters as economic growth remains materially weaker. The burgeoning debts and deficits, corporate and household leverage, and slower job growth will ensure slower growth into year-end. While the market continues to struggle with more than a year of consolidation, we are continuing to most likely watch the end of the current bull market cycle. 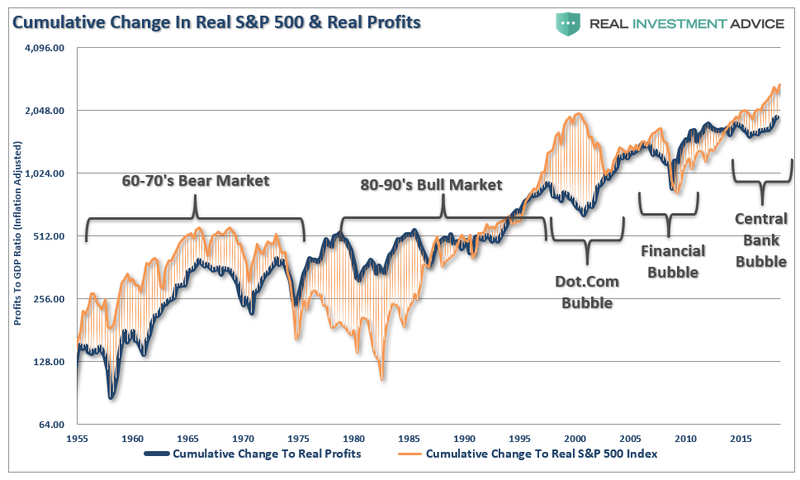 If we expand our data back to 1955, the chart below shows the real, inflation-adjusted, profits after-tax versus the cumulative change to the S&P 500. Here is the important point - when markets grow faster than profitability, which it can do for a while, eventually a reversion occurs. This is simply the case that all excesses must eventually be cleared before the next growth cycle can occur. Currently, we are once again trading a fairly substantial premium to corporate profit growth. Since corporate profit growth is a function of economic growth longer term, we can also see how "expensive" the market is relative to corporate profit growth as a percentage of economic growth. 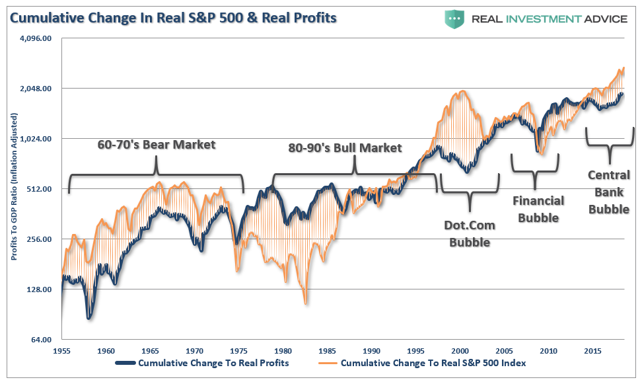 Once again, we find that when the price to profits ratio is trading above the long-term linear trend, markets have struggled and ultimately experienced a more severe mean reverting event. 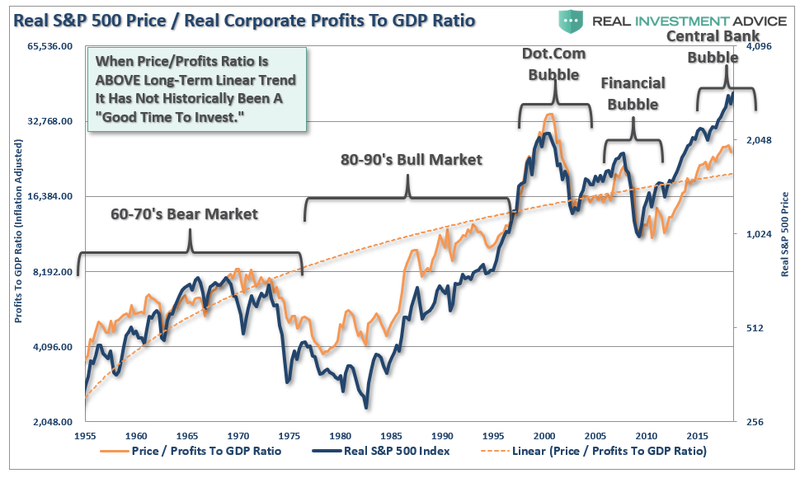 With the price to profits ratio once again elevated above the long-term trend, there is little to suggest that markets haven't already priced in a good bit of future economic and profits growth. While none of this suggests the market will "crash" tomorrow, it is supportive of the idea that future returns will be substantially weaker in the future. With analysts once again hoping for a surge in earnings in the months ahead, along with an economic revival, it is worth noting this has always been the case. Currently, there are few, if any, Wall Street analysts expecting a recession currently, and many are certain of a forthcoming economic growth cycle. Yet, at this time, there are few catalysts supportive of such a resurgence. The Fed isn't hiking rates, but they aren't reducing them either. The Fed isn't reducing their balance sheet any more after September, but they aren't increasing it either. Employment growth is going to slow. 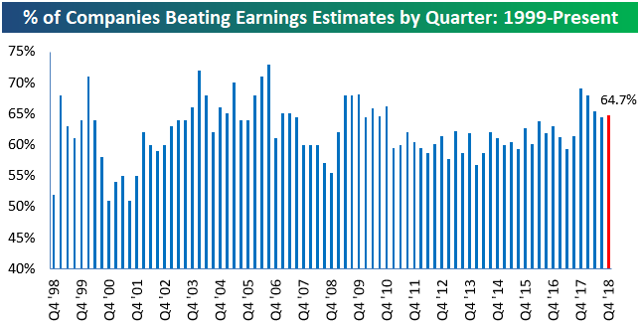 "The deterioration in earnings is something worth watching closely. 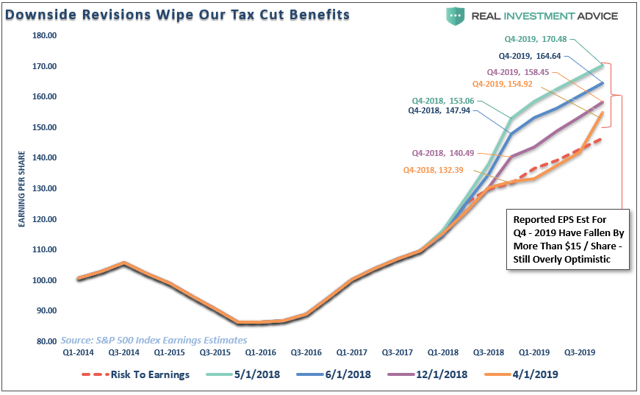 While earnings have improved in the recent quarter, due to the benefit of tax cuts, it is likely transient given the late stage of the current economic cycle, continued strength in the dollar and potentially weaker commodity prices in the future. Wall Street is notorious for missing the major turning of the markets and leaving investors scrambling for the exits. Of course, no one on Wall Street told you to be wary of the markets in 2018. While we did, it largely fell on deaf ears.